Want to become a qualified carpenter? This ITAB managed apprenticeship is ideal if you are already employed in the construction industry but don’t yet have a formal building qualification. You’ll combine both theory and practical workshop knowledge, through attending block courses at NorthTec, with on-the-job training from your employer. Applicants or their employers do NOT have to be members of the Certified Builders Association of New Zealand. Theory units are delivered in small tutorial groups backed up with practical workshop experience. There will be time-tabled on-site visits and assessment of practical units. Understand and apply a broad practical working knowledge of the fundamentals required in the carpentry trade in order to undertake all carpentry work, including; tools and equipment, materials, the legislative framework, regulatory requirements, drawings and specifications, building types, methods of construction, building science, building mathematics, and communication. Competently plan and carry out all aspects of establishing and maintaining construction sites including preparatory demolition and set out for buildings. Competently plan and carry out all aspects of the construction of; framed and solid foundations, and retaining walls. Competently plan and carry out all aspects of wall, roof, ceiling, column, post, beam and portal construction to form frames and structures of buildings. Competently plan and carry out all aspects of roof claddings, joinery and wall claddings. Competently plan and carry out all aspects of insulation, linings, finishing trim, joinery, hardware and sound control systems. Self-manage on-going learning and supervise the learning of others with a responsibility to maintain the professional standards of the construction industry. Operate competently and unsupervised to the required safety, technical, quality and productivity standards expected in a commercial environment. 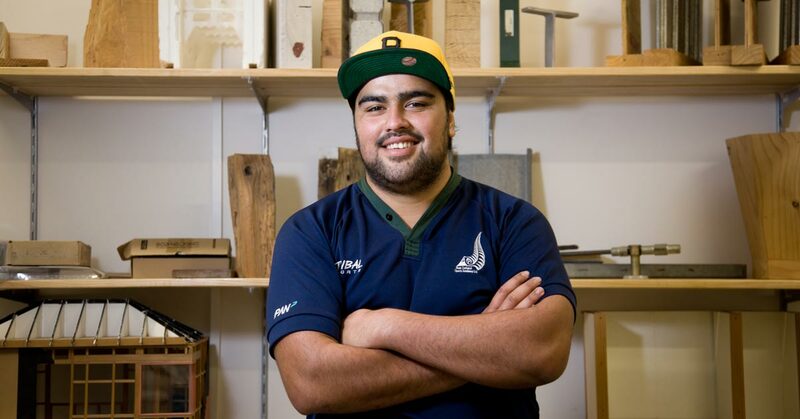 To be awarded the New Zealand Certificate in Carpentry (Level 4), students must achieve 320 credits offered in the programme. Aim: To enable students to work safely in a construction environment. Aim: To enable students to develop core construction and communication skills. Aim: To enable students to prepare a building site for building work. Define sub-contractors’ roles in construction. Aim: To enable students to develop safe practical skills for building work. Accurately measure and cut materials to specified dimensions. Aim: To enable students to develop practical capability in foundation and floor systems for building works. Aim: To enable students to develop practical capability in roof structure for building work. Aim: To enable students to develop practical capability in weather tightness for building works. Aim: To enable students to develop practical capability to fit out interiors for building work. Aim: To enable students to construct concrete and timber substructures with minimal supervision. Aim: To enable students to use documentation to prepare a construction site for building work. Aim: To enable students to complete an exterior envelope for building work. Aim: To enable students to prepare and fit out internal environment. Aim: To enable students to supervise building work on site. Aim: To enable students to plan for building work on site. Aim: To enable students to identify the requirements for support structures and floor systems for construction. Aim: To enable students to understand the requirements to construct wall structures. Aim: To enable students to understand the requirements to construct roof structures. Aim: To enable students to understand the requirements to fit out the interior of a building. Aim: To enable students to understand the requirements for roof cladding systems. *Course offerings subject to NZQA approval. Be at least 16 years old at the time they commence the programme. Be able to read, write and communicate in English at a basic level. Be working in the construction industry as an employee or contractor. Be supervised by someone who is prepared to support the training. Enter into a training agreement with the employer and NorthTec which outlines the responsibilities of each party. Applicants, for whom English is not their first language, must have an IELTS Academic score of 5.5 with no band score lower than 5.5; or hold an accepted international equivalence.